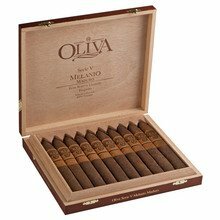 Oliva Serie V Melanio Double Toro is a stunning big ring offering from this award winning super premium brand. This slow-burning 6 x 60-ring behemoth, packaged in a box of 10, will leave you ample time to enjoy the complex flavors of wood, leather, coffee notes, and warm buttery toast. Scrumptious from first puff to last, Serie V is one of the crown jewels from the famous Oliva line. 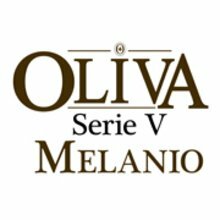 Each box of premium cigars from Oliva Serie V Melanio includes a Boveda 2-Way Humidity Pack to maintain the ideal moisture levels for the cigars. Click here to browse our line of innovative Boveda products. Both times it was from a friend who keeps His humidor a little too humid only thing I have to say is, I had several real life issues I only think it was because they were too moist. Otherwise nice tasting will meet cigar. I had been wanting to try this stick for a while to see what all the fuss was about. I finally had a chance to smoke one and was not disappointed. Everything about this cigar is on point. Great mouth feel with consistent draw and flavors. This is definitely one you want to smoke down to the nub. Only drawback is that it can be pricey to smoke often but if you can swing it or find a deal, this cigar is worth it. This is an amazing cigar. The flavors are a perfect blend of spice and nut. The flavor lasts throughout the cigar and it burns very clean. 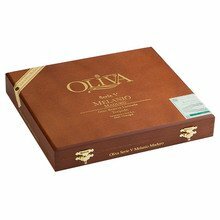 The Oliva Series V Melanio Double Toro is another fine example of the Oliva family of excellent cigar making. Great draw, flavor, smoke output, and flavor. Do yourself a favor and try one. One of the best cigars I have had. The draw is good, flavor is awesome! Let it sit for a few months and you'll be pleased. This size is a bit much for me. But the smoke is still fantastic. Its in ur face flavor yet smooth. Sweet sumatra wrap and oliva tobacco. Great smoke. Great cigar. Slow and even burn. This cigar was well worth the ranking. Full flavor. If I could afford this cigar I would smoke one every day for life! Love this cigar! Best Oliva cigar available. Superior to the other shape and is in the running for a top 5 spot. The melanio can always be counted on to produce and nice, well aged tobacco flavor and is extremely consistent. I normally pick up a little spice at the beginning and it slowly does down to a very mellow aged tobacco flavor. These cigars will always have a spot in my humidor. One of my favorites. Great cigar, smooth and creamy start to bold and flavorful. Great draw and even burn.